Hello again! 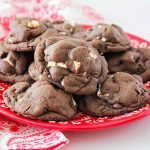 It’s Alicia from The Baker Upstairs, and I have another amazing cookie recipe to share with you today. Are you a regular dessert eater, or do you prefer to save sweets for special occasions? For better or worse, my husband and I both like to end the day with a little something sweet. The problem is, we can never decide on something we both like! My husband loves candy and will always choose candy for his treat, while I generally find myself craving baked goods. (I know, what a challenging problem to have, right?) Now, we could just each eat our own treat, but where’s the fun in that? 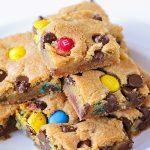 I’ve been experimenting lately with some fun ways to incorporate both of our favorites into one dessert, and have come up with a few fun ideas, like these amazing Snickers chocolate chip cookies I made a few months ago. These gummy bear heart cookies are my latest effort, and they’re the perfect solution to that candy vs. cookie debate – a cookie with a candy center! It really doesn’t get better than that, my friends. 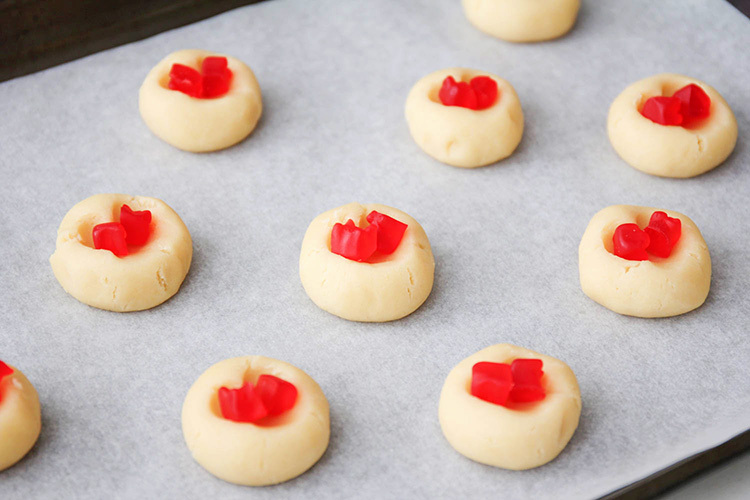 I was inspired by these gummy bear cookies on A Beautiful Mess, but I decided to change things up a little and use my very favorite (and super simple) shortbread recipe. I also chose to use just red gummy bears, since they are my favorite flavor, and I love how pretty and vibrant the red centers turned out! You could definitely use any color of gummy bear you like, or even a combination of colors for each cookie. 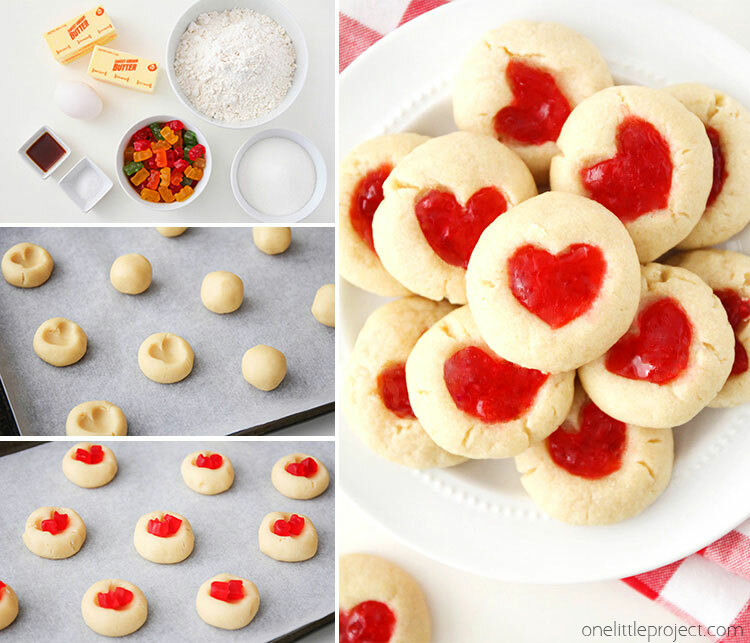 These gummy bear heart cookies would be so fun to customize for any holiday or special occasion! 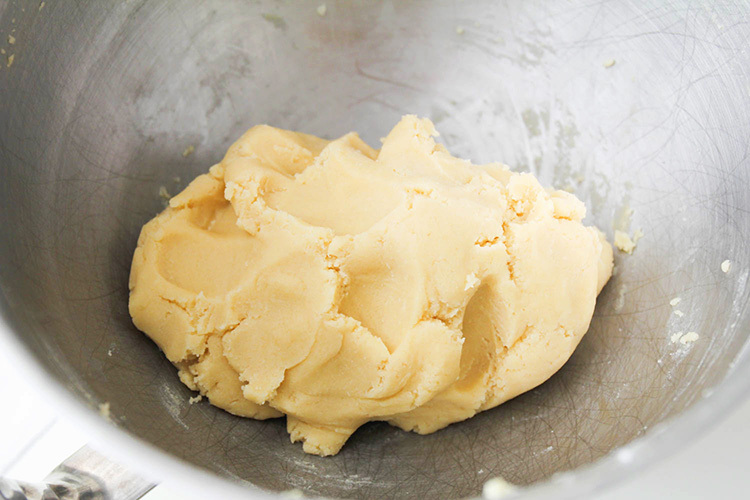 My shortbread recipe is about as simple as they come: just flour, sugar, butter, salt, vanilla, and egg. It mixes up into a thick and buttery dough that’s easy to shape into balls. 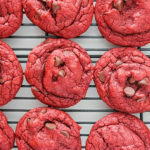 The thick texture of the dough helps the cookies maintain their shape while baking, and gives the finished cookies the perfect crisp and crumbly texture. 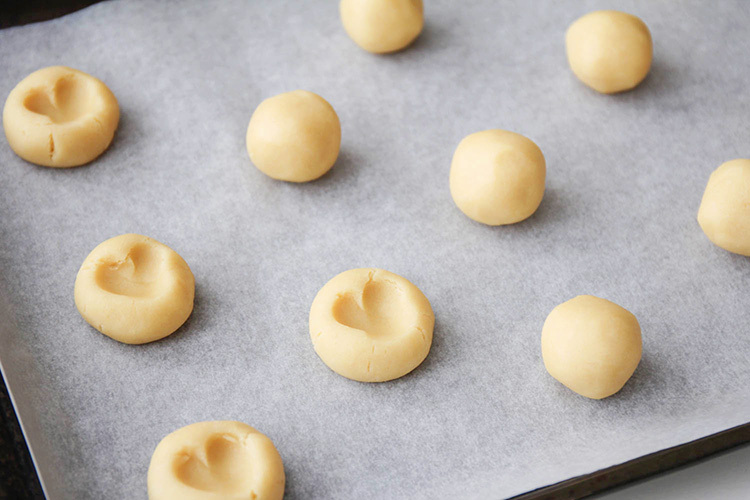 Once your dough is mixed, you’ll roll it into one inch balls, and space them about two inches apart on a baking sheet. Next, you’ll make a heart shaped indent on each ball, using your finger tips. I used my pinky finger to make the indents, since my hands are pretty large, but if you have daintier fingers than I do, I’m sure your pointer finger will work fine. 🙂 Look how cute they are already! 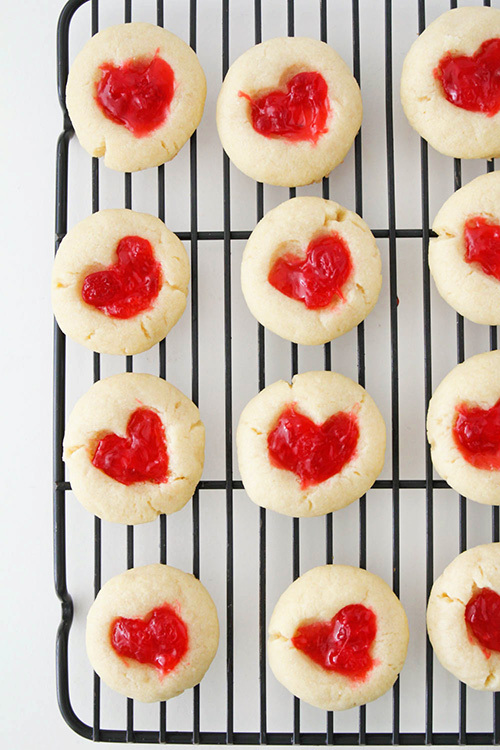 Next, you’ll add two gummy bear halves to the indent in the center of each cookie. I tried to place mine in a v-shape to help the gummy bears flow into more of a heart shape as they melted. Bake the cookies for 9-11 minutes, or until the cookies are lightly golden on the bottom and the gummy bears are melty. The original recipe showed the gummy bears liquifying completely, but my gummy bears stayed more or less in their original shape, but got melty on the inside. I used a toothpick to gently spread the gummy bears inside the indented area of the cookie, and they spread pretty easily. I’m not sure if my gummy bears were a little more stale than the other blogger’s, or if there’s a difference in meltiness depending on which brand you use (I just used a generic store brand). So, if your gummy bears melt completely, great! If not, just know that you can easily spread them with a toothpick. Just be careful not to burn yourself with that hot molten gummy bear! Allow the cookies to cool completely before eating. As they cool, the gummy bears will firm up again into a soft gummy consistency. 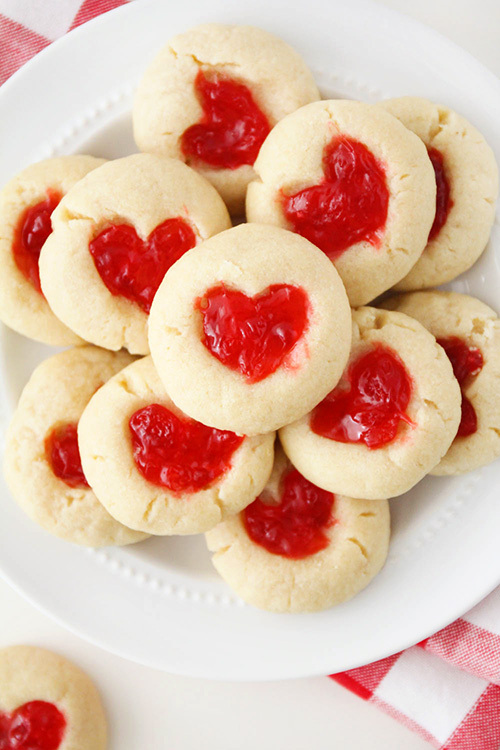 The chewy and sweet gummy centers are the perfect contrast for the buttery and crumbly shortbread cookies! My kids kept trying to guess what was in the center of the cookies, and they were amazed and excited to find that they were gummy bears! The melted gummy bears taste similar to jam, but with a more intense flavor and sweetness. Yum! 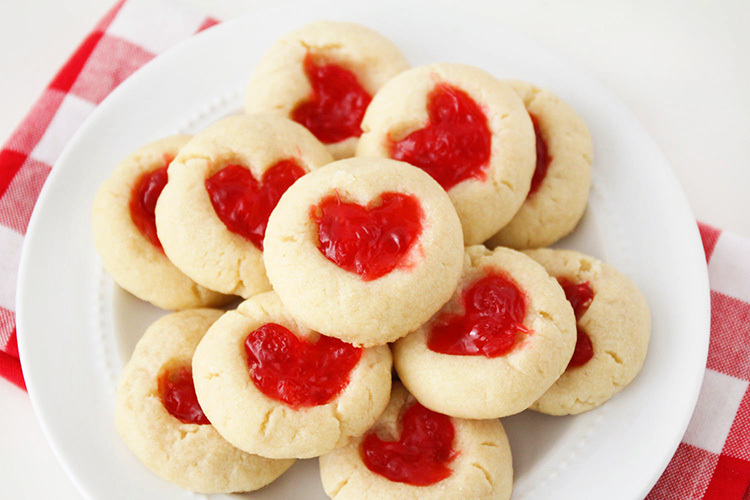 These gummy bear heart cookies are the perfect choice when you just can’t decide between a cookie and a candy! And they’re not only delicious, but super cute too. 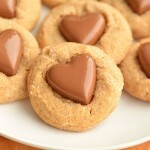 These cookies will definitely be a new favorite for kids and grown ups alike! Thanks Alicia! 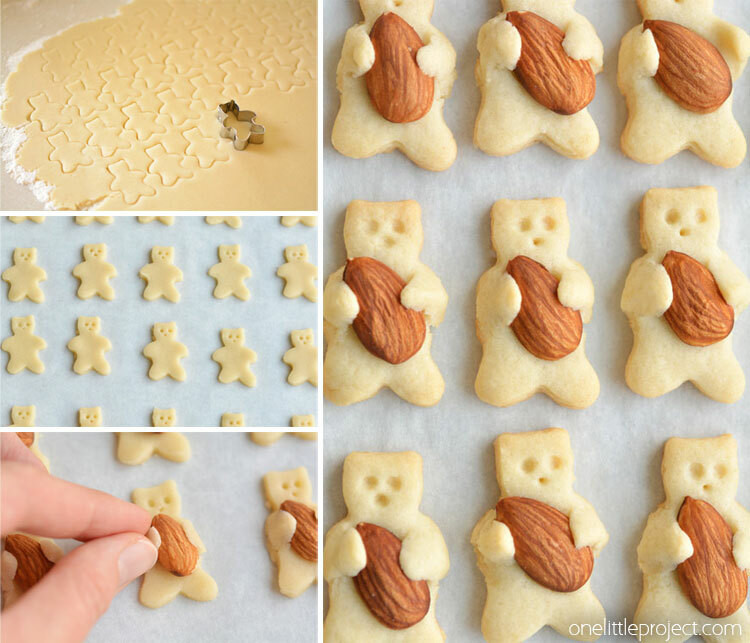 If you’re looking for more cute and delicious cookie recipes, be sure to check out our adorable teddy bear cookies. These little guys were soooooo cute!! 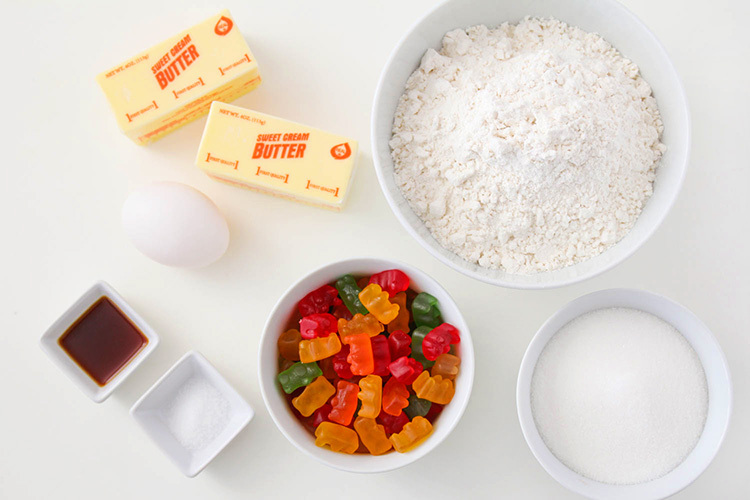 My doughter loves gummy bears, she saw this pictures and we made the cookies, the dough is great, tasty, we had problems with the gummy bears. I’ve used serbian, heart-shaped gummies,they look great raw, but while baking they’ve melted too much, all out of the cookies. The hungarian Tesco-gummies didn’t melt at all, and the german Haribo gummie bears turned out best, but they also melted too much… But they are yummie after all! !